This has been my fruit ADV for the better part of the year so I've been refraining from sharing it until it was just right. I've put it through 9-10 iterations and this is where I'm at but this isn't even its final form. Originally, I wanted the profile to be a very sweet-guava laden candy. As a candy, it was delicious but I found that at the percentages required to get there, about 1 in 5 people (myself included) would get a bit of a soapy note, so in an effort to eliminate that it has become a fruity, tropical drink. 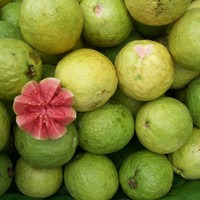 CAP Sweet Guava: This is the star of the show, love me or hate me for using such an easy fruit as the main profile, Sweet Guava is sweet, tart, and fairly complex as far as a fruit flavor goes. An interesting fruit that not too many people in the states have even eaten, it keeps me and many others coming back again and again for more. INW Pineapple: This is hands down the best pineapple in 9/10 scenarios in my opinion. It's very fresh, and ripe tasting but does not border on rotten tasting as many ripe fruit flavorings do. Very authentic and far from a syrup, at 1.5% works very well and accentuates further the sweet/tangy thing that the guava has going on. TFA Key Lime: A very solid lime flavor, adds a citrus note to really bring the tangyness of this juice to the forefront. Works well here but could be subbed for whatever lime you like. I personally find myself subbing this out occasionally for LA Banana Cream at 3% for a creamier, banana-laden vape (which is delicious). One of my all-time favorite versions of graffiti though, is using FLV Mango here instead of the lime at 2% for a sweeter, in your face, tropical punch. FA Passion: Adds more depth and texture to the vape. Passion at this percentage doesn't carry much but its texture, if you turn it up to 1% you get a bit of a peach type note in the flavor but I like it where its at. If you take this up to 1.5% you get the candy ish flavor I mentioned in the intro, but the soapiness starts to come through. Try it where its at, play around with the percent if you want to later. INW Cactus: The juiciness booster that makes authentic fruit flavors just really pop and become addicting in my opinion. If you don't have cactus in your arsenal here, TFA Dragonfruit works well at 1.5% but you really should always have a bottle of cactus on hand. Mix it up and let me know what you think! This is what I believe to be my best creation in a year and a half of mixing! Update 4/25/18: Adding 1% of TFA Apricot takes this recipe to a whole new level! This recipe is the property of Werttok and released under the All The Flavors Public Domain license. You may not copy, derive or commercialize this recipe without following the terms of this license or the explicit permission of the creator. I also replaced the INW pineapple with CAP golden pineapple (sorry) but it works perfectly. Such a tasty and complex recipe, extremely vibrant and fresh.